Thinking of partying with your best buddies to Clermont? It is so easy to check out all the sights and visit different party spots in the city with your very own party bus Clermont. There are a lot of great places to visit and fun and entertaining sights too but getting there as well as other destinations could be a pain especially when you are a large group. Our service will easily fit everyone and will fit your budget too. Book now, call 407-374-2370. If you are looking for a fun yet cost-efficient way to travel with your friends then you got it with a party bus Clermont FL. This is not just the most convenient way to travel but will also be the most luxurious since you have the most updated features at your disposal. Your friends will absolutely love checking out the cool audio and video plus gaming equipment on board these buses and don’t forget the best in luxury interiors with plenty of room for every one! Your bus rental will never be complete without your professional limo driver. He can safely take you to different city destinations and all the fun getaways even when you are partying in a party bus. You can also ask him for great recommendations if you are new to the city. You might also want to check out our Limousines in Clermonty FL! Booking is fast, easy and very convenient. You simply need to find out how many you are in your group and you will surely find the best party bus ride in no time. And when you are done, simply call or email them for a reservation. You will only be asked a few personal questions to reserve your ride, that’s all. It is important to book your ride as soon as possible. Busy seasons such as holidays and summertime could be a very tough time to book so make a reservation at least a week or two before you arrive in Clermont. Search all Central Florida party buses. Call now to discuss prices or availability with our live support team, 407-374-2370. Lake Minneola – this is a wonderful body of water where there are a lot of locals and tourists who come for fresh air and sunshine. Clermont’s Historic Village – travel back in time to see how Clermont used to be. It is a great exhibition open all day for tourists and locals alike. Lakeridge Winery and Vineyards – this is a tour that every wine aficionado needs. Get to take home a few bottles too for the best price. Duck Duck Booze – a fun and rowdy crowd will greet you at this popular bar in the city. Tell your chauffeur to take you to your chosen destination the minute you arrive from the Leesburg International Airport. You can also instruct our drivers to take you to nearby cities such as Winter Springs, Casselberry, Winter Park, Orlando, Altamonte Springs, Kissimmee, Sanford, Oviedo, Apopka and Lakeland. 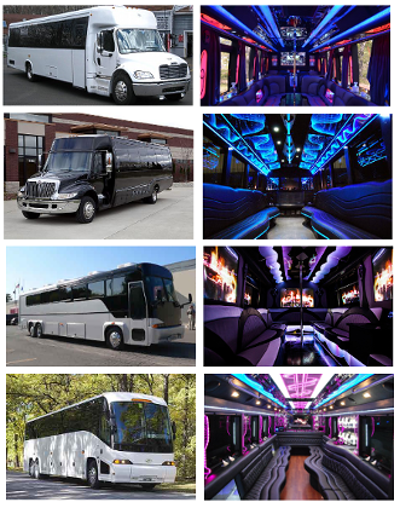 Be sure to check out party bus Party Bus Kissimmee, Party Bus Lake Mary, or Party Bus Lakeland.